This weekend you will get one of the best chances to see a total lunar eclipse, a spectacular astronomical event during which the moon turns red – and is therefore also known as a blood moon. The event takes place during the evening of 20 January, 2019, in North America, and in the UK during the early hours of 21 January – with the eclipse lasting several hours, with the spectacular red-colored totality lasting about an hour in the middle of the event. You can find out all about the event, and how you can shoot it, in our article on how to shoot the blood moon 2019. 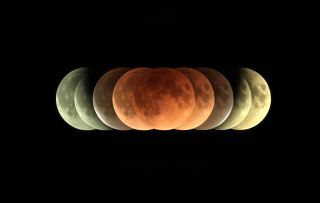 But to inspire you to stay up this Sunday night, we have teamed up with stock agency Shutterstock to bring you some super shots that professional photographers and astrophotographers have taken of previous total lunar eclipses. Here are five Shutterstock images that show you just what can be achieved, along with full details from the photographers on how each of these pictures were taken. "This image was shot on the night of 20-21 February 2008 in Kragujevac, Serbia. I joined up with astronomical society Aristarchus – It was a perfect night sky to shoot the Red Moon and also my first total lunar eclipse to see and photograph. "The picture was shot with a Canon EOS 350D DSLR with an MTO 1000mm f/10 mirror lens – supported on a Skywatcher EQ-2 equatorial mount. The exposure was 2 secs at ISO 200". "This is a photo of the super blood moon, or the total lunar eclipse, which occurred in Thailand. The photo was taken with a DSLR camera shooting through a Schmidt-Cassegrain 9.25-inch telescope, with an effective focal length of 2350 mm f/10 and the star-tracking-mount system. "The shot was taken during the peak stage of the total eclipse phenomenon. The photo was captured with a single shot technique, so the image has details with a high resolution. All details of the moon at that time can also be viewed clearly." "This is the entire total lunar eclipse sequence of 28 September, 2015 over the Upper Peninsula of Michigan, USA. You don't really need to have a degree in astrophysics to be able to plan ahead of time and know where and how the eclipse is going to go down to properly compose your frame. However, being an actual astrophysicist definitely gave me some advantage". "The entire eclipse sequence can take quite a while, so it is not common to be able to observe the entire sequence. In this photo I was fortunate enough to be at the right location with the right sky to observe an entire thing. This eclipse is especially rare in that it happened during the 'Supermoon' (as opposed to total lunar eclipse in 2018 where it was a 'Micromoon'). This means this lunar eclipse appeared just about as large as the moon could ever get. "Every single moon you see in this image is shot with the same camera and lens on the exact same location. If you were to stand there and watch, you would have seen the sequence went on just like this. Each image is taken over five-minute intervals where all the moons are overlaid on top of a single shot during totality. "Every image is shot with Nikon D800E and Nikon 14-24mm f/2.8 wide-angle zoom. The exposure varies from 1/400sec during partial eclipse to 2 secs during totality. A single shot of 20s exposure was used as the background image for the overlay, during totality where the moon became dark enough that the entire night sky became visible once again". "It’s often the case that when an eclipse or any special astronomical event occurs it’s cloudy in the UK, so when it turned out to be clear for the lunar eclipse of September 2015 I had to get myself kitted up and to a dark location before it kicked off just after midnight. "Greenwich Park in London isn’t far away from me and ticked all the boxes, so I hopped the fence and spent the night watching the eclipse on my own for almost 6 hours. It’s amazing to see the background stars sparkle during a full moon. "This was shot with a Sony A7 Mark II coupled to a Sky-watcher Equinox 80ED telescope using a Sony E-Mount 2-inch UltraWide True-2 Prime Focus Adapter. The telescope and camera were mounted on a Manfrotto 410 head which itself sat on the polar-aligned Astrotrac TT320X-AG tracking mount, this was then positioned on another Manfrotto 410 head using a Manfrotto 058B tripod. "The exposure for this frame was four seconds." "This image was taken during a Lunar eclipse on 31 January 2018 in Thailand. It was a composite created from nine images taken 20 minutes apart, centring at mid-eclipse at 9.30pm local time. "The sky was clear but the Moon rose after partial eclipse had started, thus the image showed only the time series from the beginning to the ending of the partial eclipse. The exposure time of each sub-image varied as the Moon’s brightness changed overtime (varied from 1/5 sec to 2 seconds). Each Moon image in the composite was made from 5-6 subs that blended together to keep noises at the minimum. "The images were taken through a telescope using a specialist SBIG STF-8300C color CCD camera. I used a Takahashi FSQ-106 530mm f/5 refractor telescope with a 1.6x extender (to 850 mm f/8); this set-up was attached to an Astro-Physics 1100 GTO equatorial mount. "Exposure times varied from 0.2 seconds (brightest moon) to 2 seconds at mid eclipse, with 5-6 frames bracketing".